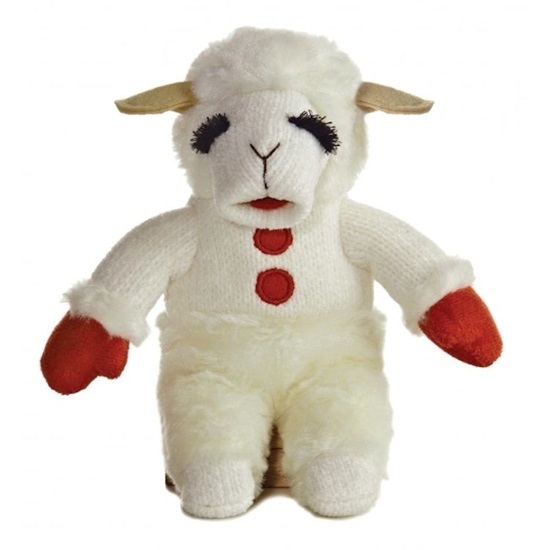 This sweet little lamb is as soft and cuddly as ever, and small enough to take anywhere.. This is a beanbag lamb that is made up of soft white chenille with soft furry plush on her legs, wrists, and head. Her feet are a soft white chenille, and her mittens are a soft red plush. Her face is a soft white chenille with tan felt ears,and beautiful thick black furry eyelashes. A soft plush red tongue, along with two red buttons that run down her front add the finishing touch to this sweet little beanbag lamb. She is 8 inches long and is surface washable.